The school logs exist dating from 1870 to the 1960s and contain weekly entries by the Head. I have scanned them to PDF and have a transcription of the highlights. They are not published at the moment until the School's Governing Body has the chance to consider any issues of confidentiality. I can check for any entries. Many entries are mundane and refer to the weather and attendance but the annual reports often name children worthy of mention and miscreants do of course make the logs! The war years are of particular interest, as are the first 30 years where the School receives weekly visits from the Mallorys and their circle of friends. Below is a composite of historical information from existing texts, the internet (in blue) and the logs. It is probable before this school was built that the teaching was done in the steeple of the church. Mobberley’s steeple was built at the same time as that of Rostherne (1533) where records describe the teaching there. 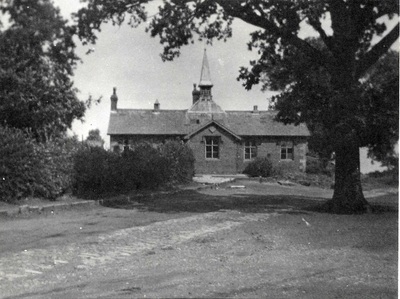 At Davenham, where Dean Mallory was also rector, the school was held under the steeple. 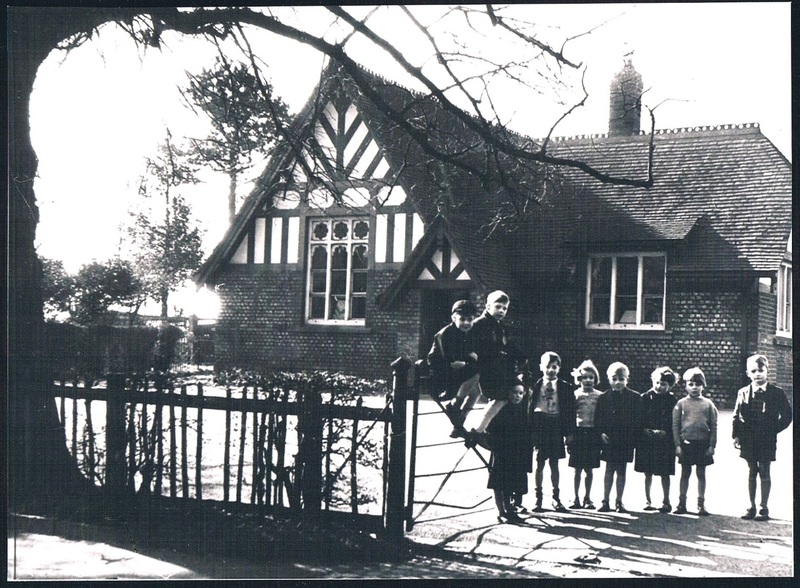 The salary at Mobberley School, which was only free to the parish, was £10 10s 0d. Grandmothers of today (early 1900s) remember with gratitude their schoolmistress at Mobberley, Miss Lamb, while grandfathers can testify to the excellent teaching of Mary Cragg and James Earl, the village schoolmistress and parish clerk respectively." 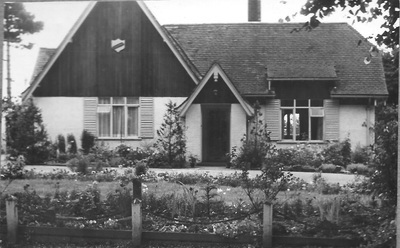 The original school was allowed to remain standing until 1852 and some of the timbers for the construction of the lych-gate came from the school building. The present buildings were started in 1838 where it appears that the school consisted solely of what is the current hall. The floors were flagged and it was not until the Inspector commented on this that in 1873 a wooden replacement was installed. There was neither artificial light, nor heating and the water came from a pump at the well that stood in the middle of the current car park. There was little in the way of furniture or books. In 1839 government grants for the construction and maintenance of schools were switched to voluntary bodies, and became conditional on a satisfactory inspection. Each year there was an inspection by both the Diocese and HMI. 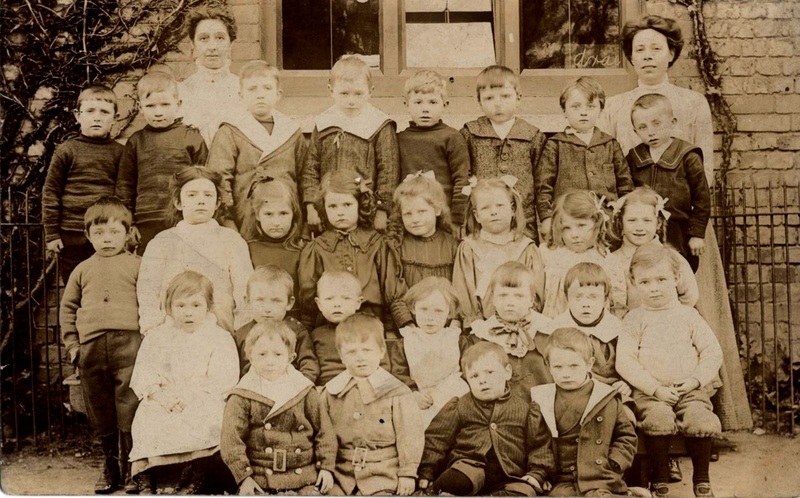 The Forster Elementary Education Act 1870 required partially state-funded board schools to be set up to provide primary (elementary) education in areas where existing provision was inadequate. Board schools were managed by elected school boards. The schools remained fee-charging, but poor parents could be exempted. The previous government grant scheme established in 1833 ended on December 31, 1870. 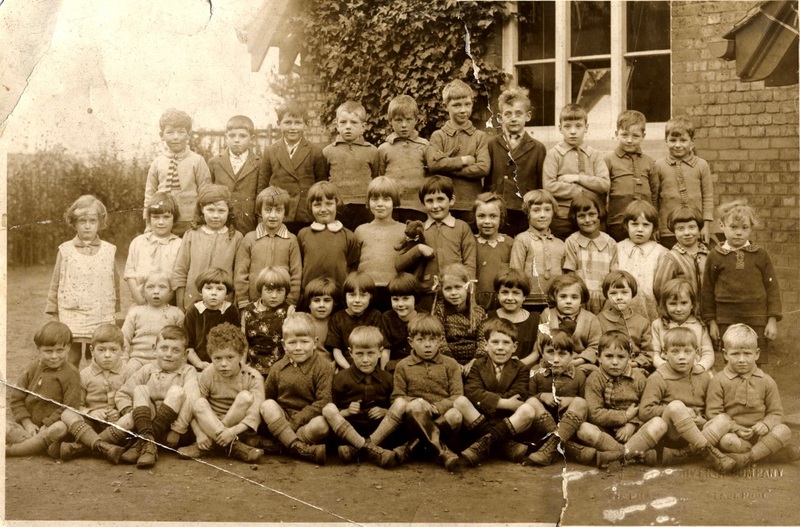 The Act meant that compulsory attendance at school ceased to be a matter for local option, as children had to attend between the ages of 5 and 10, with exceptions such as illness, if children worked, or lived too far from a school. The Act empowered school boards to make bye-laws for educating children between the ages of 5 and 13 but exempted any child aged over 10 who had reached the expected standard (which varied by board). [Section 74 of the Act]. In 1873 the girls, taught by sempstress Miss Harriet Jackson came under the control of the Master. Her lack of punctuality was referred to on several occasions but it seems that not much changed while she lived at Baguley Green. 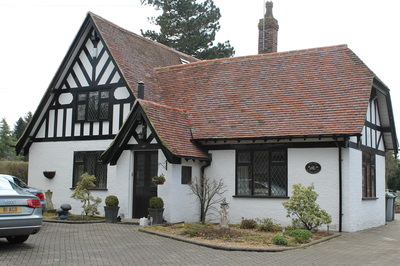 Perhaps it improved as a result of her moving to Ivy Cottages in Church Lane. 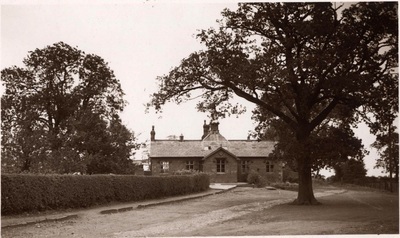 (In 1875 the Infants School was built in Hall Lane by Mr Harter of the Old Hall - see below - but the Church School continued to accept infants until 1899 when the Inspector's report stated that "unless it is a positive hardship, the infants should be required to attend the Infants' school as their presence interferes somewhat with the instruction of the older scholars". When the new Master, Mr Bermingham took over in 1877 he commented in the log that some pupils had left to go to a school established by Mr Drinkwater, previous ‘Master at this School’. James Drinkwater was born in 1813 in Mobberley. In 1841 he was resident in Lady Lane and in 1851 and 1861 had relocated to near Newton Hall and there was certainly a girls’ school operating in Newton Hall in 1868. But by 1871 he was in Great Warford farming. 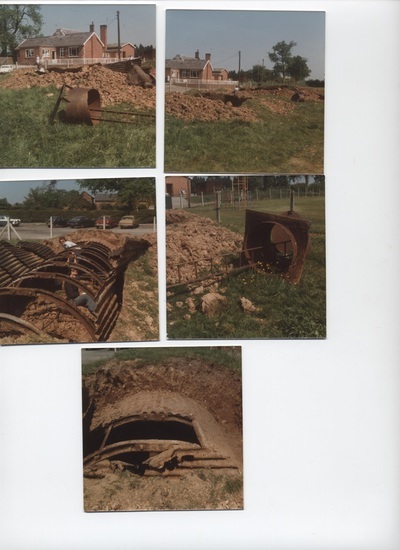 It’s not clear where his school was now located or who was running it. Mr Bermingham refers to the managers wanting him to stay but he left after a short period as he couldn’t accept the obligation to take wine in the Church and John Catanach took charge later that year (1877). 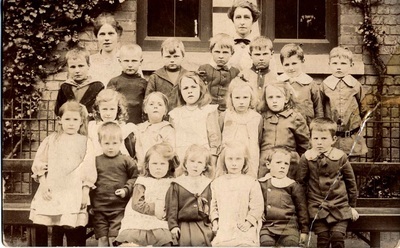 The Elementary Education Act 1880 insisted on compulsory attendance from 5–10 years. For poorer families, ensuring their children attended school proved difficult, as it was more tempting to send them working if the opportunity to earn an extra income was available. Attendance Officers often visited the homes of children who failed to attend school, which often proved to be ineffective. In 1880 her Majesty’s Inspector wrote that attendance must not exceed an average of 123 ½ in the existing premises or the grant would be forfeited and in 1881 the buildings were extended to the rear. 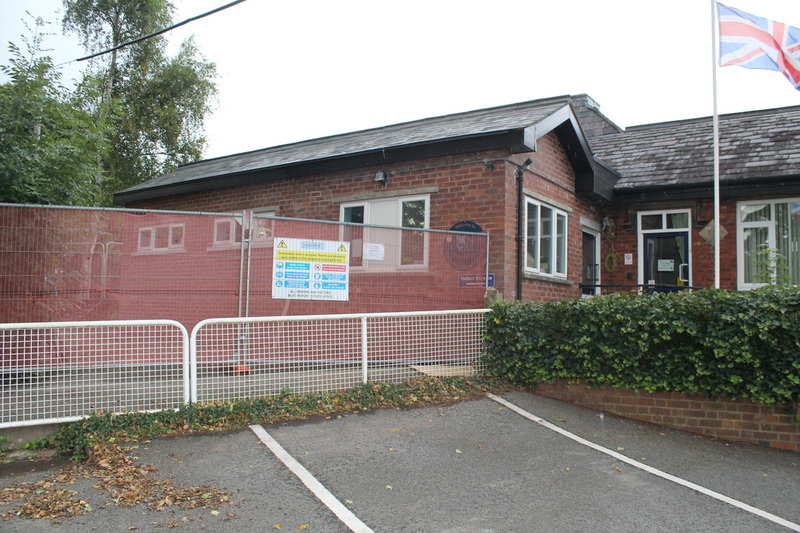 When the School reopened in July, the building wasn’t ready and they had to start in a large wooden shed by the Church Inn. In 1882 the Master wrote of the frustration dealing with the Attendance Officer whose efforts seemed ineffective. He commented that children were running about in the lanes. Joseph and Elizabeth Simcock had not attended between April and September. 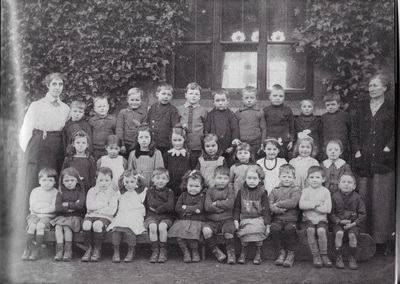 The Mill closed in 1887 and many families moved away from the village reducing numbers at the School. Throughout the 1890s the annual reports by her Majesty’s Inspector were critical of both learning and teaching. In 1898 the Inspector recommended a partition be installed and it appears that they weren’t impressed by Mr Catanach’s leadership. In 1899 they wrote that “the instruction might well be made less mechanical and the whole working might well be carried on under a more gentle and refining influence". In 1900 Mr Catanach left (was he pushed?) and Mr Joseph Holt took charge. Immediately, incentive schemes were introduced for attendance, along with prize giving ceremonies for achievement. The controversial Conservative Education Act 1902 (also 'Balfour's Act') made radical changes to the entire educational systems of England and Wales. 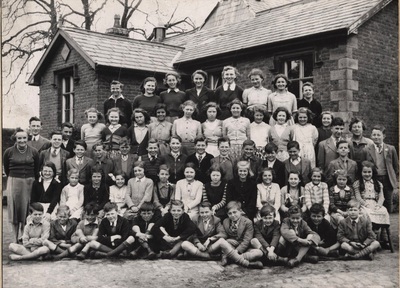 It ended the divide between schools run by the 2568 school boards and the 14,000 church schools, largely administered primarily by the Church of England, which educated about a third of the students. Local Education Authorities were established, which were able to set local tax rates, and the school boards were disbanded. 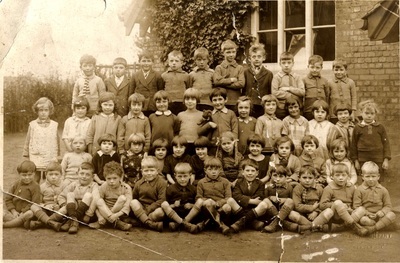 Funds were provided for denominational religious instruction in voluntary elementary schools, owned primarily by the Church of England and Roman Catholics. Mobberley came under the “New Authority (Cheshire Education Council) for Educational Purposes” on 1st July 1903 and the logs immediately reflect a change with materials and equipment arriving and being recorded in the Log Book. Holidays were formalized. Recommendations on improvements in lighting, cloakrooms, lavatories etc. were reported. Note is made of events (such as the Ploughing Match) that in previous years had been marked by a holiday, that now did not qualify. HMI now required to be advised of certain holiday events such as the Band of Hope Temperance Lectures. Children now started to travel to Knutsford (by train) to attend cookery and handicraft classes. Whooping Cough, Scarlet Fever and Measles epidemics were frequent events accounting for poor attendance and occasional lengthy school closures. In 1904 a range of improvements were recommended including larger windows, better cloakrooms, and the position of the girls’ lavatories. 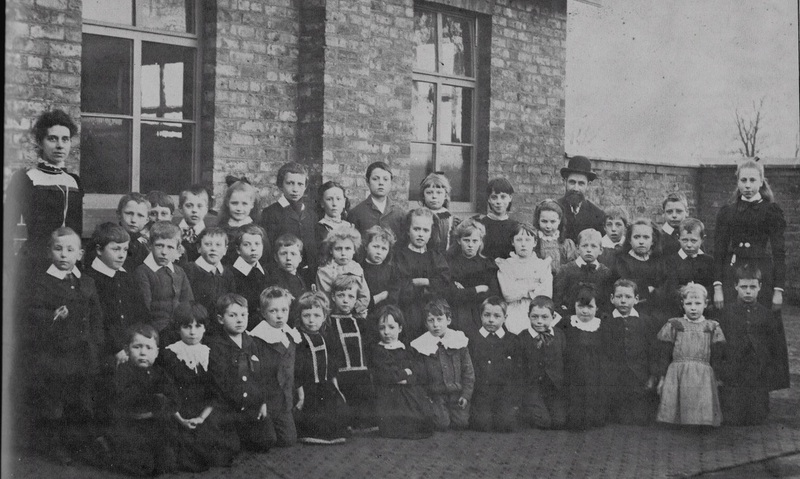 The school does not sound like a very attractive environment and in 1908 mention is made of children leaving to attend a private school run by Mrs Jessica Miranda Davenport at the newly built Inglenook in Smith Lane. As the 20th century progressed, the log entries became much more routine and mundane but occasional insights into conditions are revealed. The Great War saw the children involved in collecting eggs and making garments for the soldiers and Belgian refugees. It wasn’t until 1920 that a hot water pipe heating system was introduced; in 1929 part of the playground was concreted; six oil lamps were introduced in 1934. 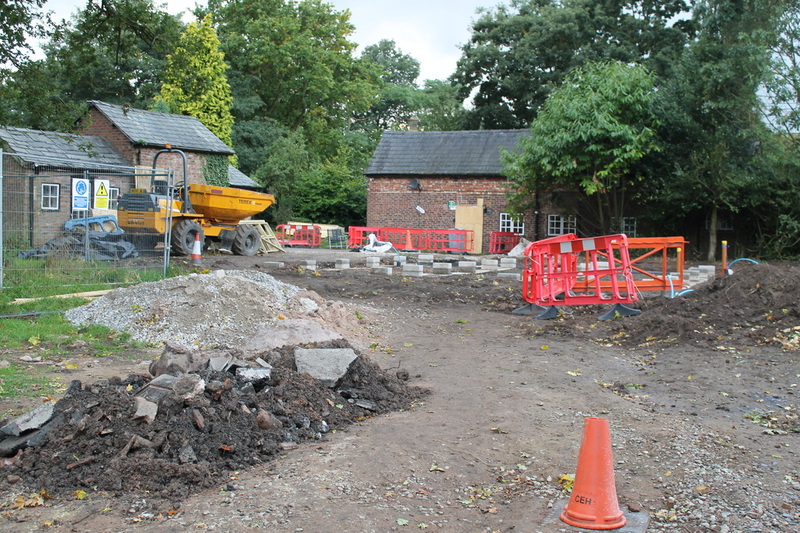 After a prolonged drought the well ran dry in February 1934 and it wasn’t until July that the School was connected to Stockport Corporation’s mains. In 1937, electric light was installed. 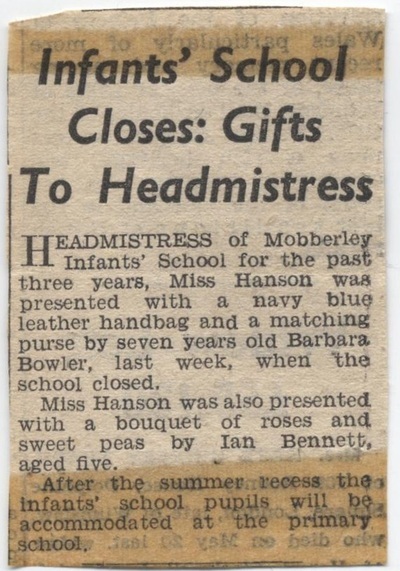 Prior to this the School had altered its hours in winter to finish earlier as nights drew in. When the Second World War started, there was an immediate impact. 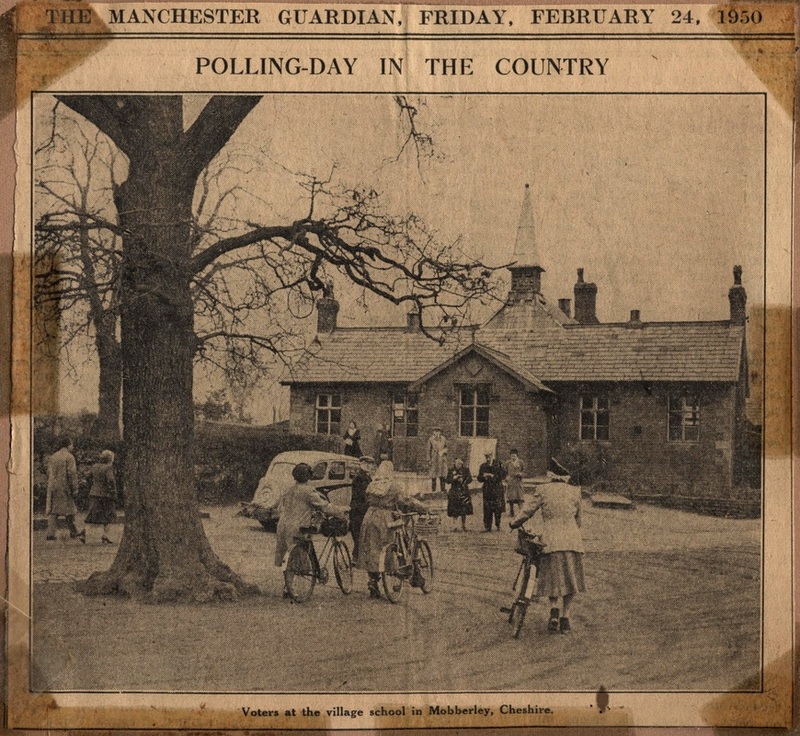 Local children were taught in the mornings and then in the afternoon the School was used by children from Stretford Road School in Manchester who had been received in the area under the Evacuation Scheme. By December, everyone was sharing the premises. Air raids were a feature of the logs throughout 1940 and the Spring of 1941. Soldiers occupied the school during the Easter holidays and a number of articles went missing. 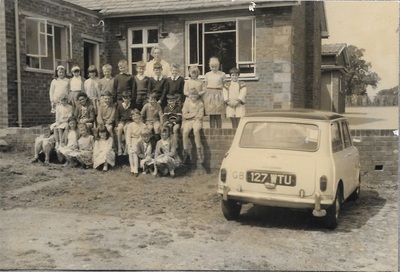 The Headmaster Mr Robinson was called up for National Service and Mr H Hunt, Mr Sydney Buckley and finally Mr J Ravenscroft took temporary charge (as members of County Emergency Staff). Mr Robinson returned in 1946 but only stayed for a year before deciding to rejoin the Royal Navy. Miss Edwards took charge. In 1943 school dinners were introduced arriving at first from Hale, then Macclesfield and finally Wilmslow depots. 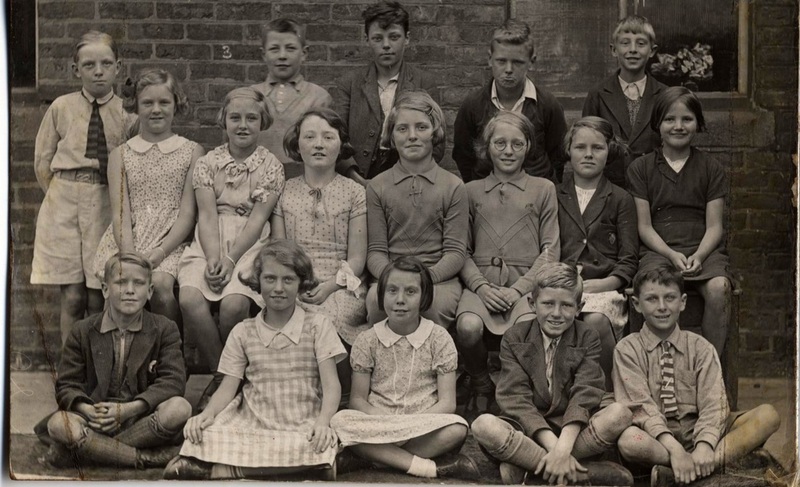 In 1944 thirty children were admitted as evacuees from London as a result of the flying bombs. Later reference is made to the Evacuation School at the Wesleyan Schoolroom. Qualifying tests are reported for the first time in March 1946 with Sheila Caveney being successful. 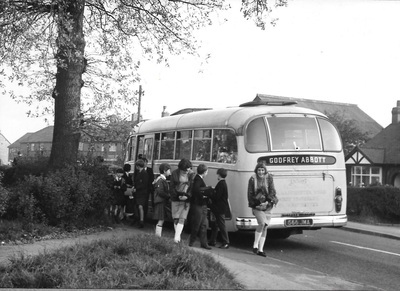 In 1953 Knutsford Secondary School opened and pupils aged from 11 to 14 no longer attended Mobberley School. 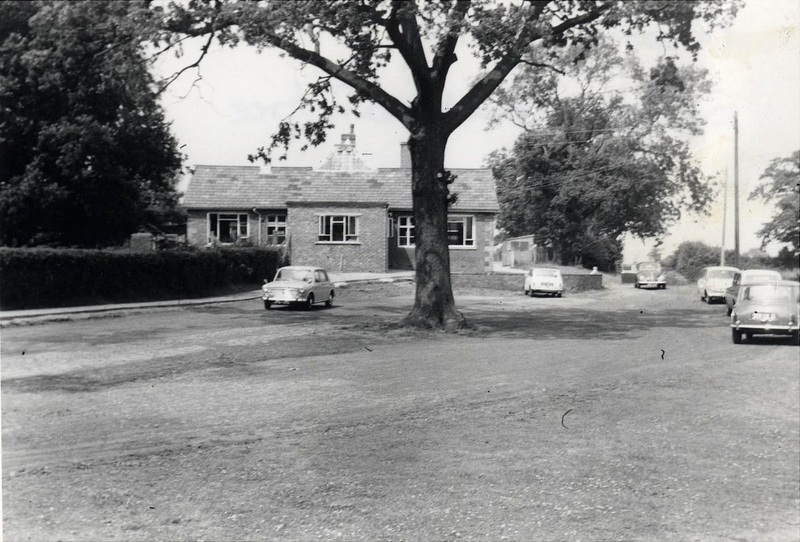 In 1956 workmen commenced on School improvements including a new roof on the front part of the School and new beech floors throughout. New 7ft windows were installed in two rooms. A scullery had been completed in 1957 and a telephone was now installed. 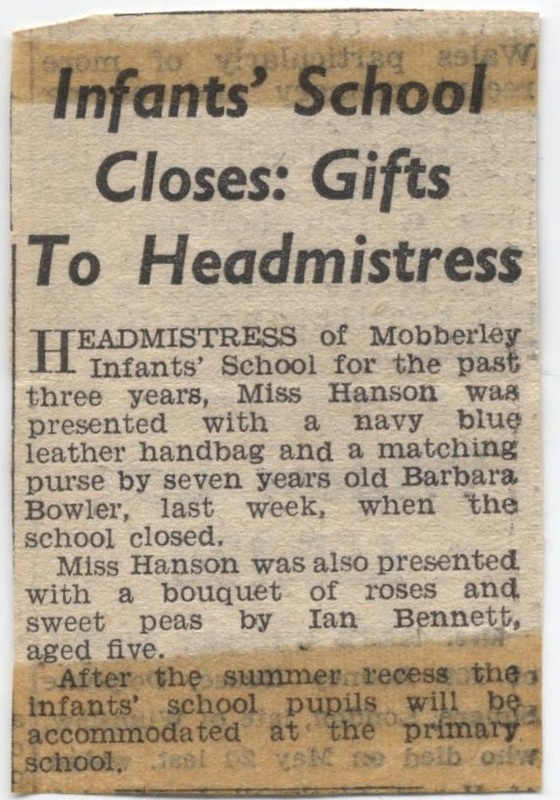 In June 1958 the Head-Teacher received official notification that the Infants’ School would close in the summer. 67 children arrived from Hall Lane in September and the school roll was now 126. A year later in September 1959 work commenced on “the new classroom” and at one point 90 children had to be taught in the front classrooms with the partition folded back. The School was built on Hall lane in 1875 by Mr William James Harter, a Salford born merchant who lived at the Old Hall in the 1870s. It was designed to accommodate 75 children although the Kelly’s Directory of 1892 says that the average attendance at that time was 32. 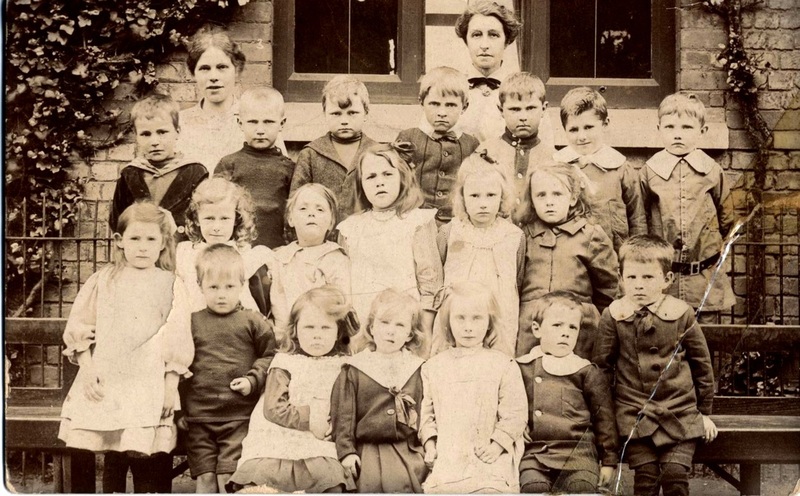 Infants were also taught at the Church School but in 1899 the Inspector instructed that this should no longer be allowed unless it caused hardship to the families. Grace Elizabeth Spencer was also born in Salford, in 1866. 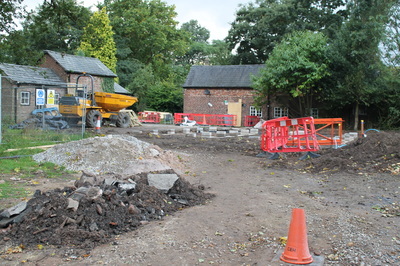 Her father Richard was a Millwright and Engineer who came to Mobberley Mill in the early 1870s. At the age of 15 Grace was described in the census as a pupil teacher. In the Mixed School Log for 1880 Her Majesty’s Inspector writes that Grace has no standing under article 32(c) but a year later she passed well in her examinations. 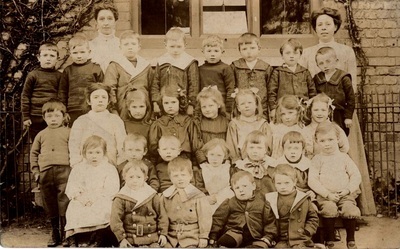 In 1901 she describes herself as a certified teacher and then in 1911 as the Headmistress at the Elementary School. 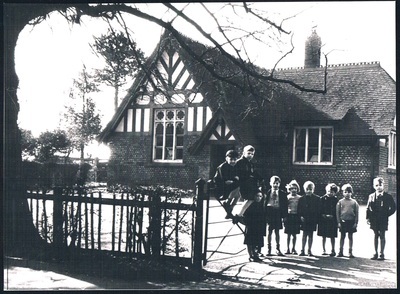 The picturesque Infants’ School, Hall-lane, Mobberley, has, for the last quarter of a century, been conducted by Miss Grace Spencer, a daughter of one of Mobberley’s one-time oldest worthies, in a manner worthy of the best traditions of the English methods of juvenile education. The parish is indebted very much indeed to Miss Spencer for the very great care she has bestowed in her work, not only during official hours, but also outside her duties in the training of the young in singing, music and patient application in carrying through many entertainments for her scholars, necessitating in a high degree patience and skill. The parish church owes much to her loyalty and zeal, and she is always ready and willing to officiate at the organ when circumstances prevent the organist’s attendance. As a slight recognition of her work Mrs. Allen, of Holt House, initiated a plan for giving expression to the appreciation of the people of the parish, and, on Saturday, Mr. And Mrs. Allen invited over 200 subscribers to their beautiful grounds at Holt House, where they were entertained. Mr. J. P. PATTINSON of Newton Hall, correspondent of the school, paid a high tribute to the work of Miss Spencer. Lady Crossley, of Mobberley Hall, was invited to make the presentation of an address, a silver tea service and purse of Treasury notes, and in a few well-chosen words asked Miss Spencer, on behalf of herself and the parish generally, to accept the good wishes of both old and new residents, and expressed the hope that she would be long spared to continue her good work in Mobberley. The address, containing 250 names, was beautifully executed, and amongst other features displayed a view of the school. Next, Lady Crossley handed to Miss Spencer a solid silver tea service (Queen Anne pattern), inscribed as follows: “Presented to Miss Grace Spencer, in recognition of 25 years’ valuable work in the Mobberley Infants’ School, by the parents and of their appreciation, - Easter, 1916.” Lady Crossley also handed to Miss Spencer a purse of Treasury notes (£30), the purse of Russian workmanship, given by Mrs Leycester, late of Mobberley, Old Hall, and now resident in Switzerland. 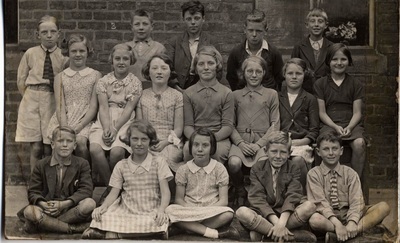 Infants School - Miss Spencer top right I think.